For episode 27, Geoff Moes (@ThallidTosser on Twitter), Nat Moes (@GrandpaBelcher), Josh Chapple (@joshchapple), and Sam Krohlow (@sillysam71) whine about Workshops in Vintage, and then get down to business talking about where to eat at GP Columbus and Eternal Weekend. Because we’re still a Vintage Magic: The Gathering podcast, we open with a few thoughts about the Vintage metagame. The recent restrictions of Chalice of the Void and Lodestone Golem seem so far to have done more harm than good, as the environment has tilted heavily towards blue. In the most recent MTGO Power 9 Challenge, 27 out of 60 players played Gush, and only four played Workshops. We think that’s kind of a problem. However, we hope that things can still adjust as Shops pilots find their place again in the world. Mishra’s Workshop is too good to be this bad. Obviously the big upcoming event for us is Eternal Weekend, but we’ll get to that in a second. Eternal Weekend is moving from Philadelphia to Columbus and will be October 27–30. Be there! Vintage is on Friday (which is kind of awkward) and Legacy is on Saturday, with the finals for both at non-conflicting times on Sunday. You should come; you’ll have a great time. There’s hot Eternal MTG action and more all four days. Keep in mind for both events that they start on weekdays, and Columbus is a commuter city. That means employees will be driving into and around the downtown area, making morning traffic slow and competing for parking. There should be parking at Convention Center area hotels and nearby garages, but make sure you leave enough time to negotiate traffic and finding a space if you need to get to a morning event. Also note that the Columbus Clippers are home all weekend for the GP, so there will be fans in and around the stadium in the Arena District. That shouldn’t affect the Convention Center too much, but expect some heavier traffic and parking. Clippers games are a lot of fun if you’re done with your day early and want to just hang out, eat stadium food, and watch some baseball. Tickets are usually available at the gate and are affordable. The Saturday of Eternal Weekend is an Ohio State football home game. All of the bars will have extra people that night since Columbus loves its Buckeyes, so you might have a long wait anywhere that serves alcohol and has TVs. We mention a lot of restaurants in the podcast, so I made a map that I think breaks down the most important ones. The Google Map I used starts around the Convention Center and then shows what’s an easy walk. The marked areas on this map should be relatively safe for visitors, but protect yourself anyway. Don’t take cards anywhere you don’t need to and be aware of your surroundings. 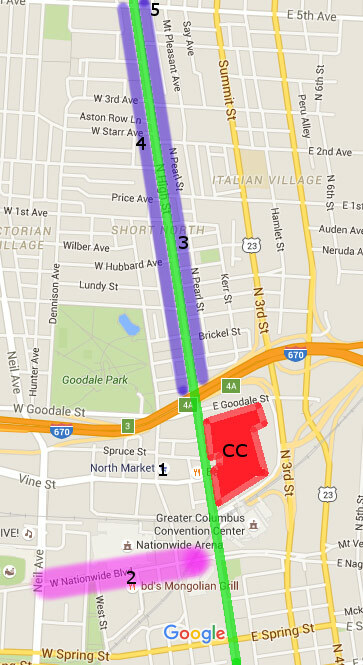 Greater Columbus Convention Center (red highlight, labeled CC) – This is where the Magic happens. Note that if you do map the Convention Center, it will actually center on the smaller southern part of the building across Convention Center Drive via skywalk. Every big event I’ve been to there has been in the much larger northern section. High Street (north-south green highlight) – High Street runs the length of Columbus straight down the middle. From the Convention Center, going north on High Street will take you immediately to the Short North, then to the Ohio State Campus, then beyond to Clintonville and Worthington. Most of the Short North is within a half-hour walk. Going south from the Convention Center will take you to the Arena District then the City Center with the Ohio Statehouse and then beyond to German Village. Walking from the Convention Center to any of the German Village locations we talked about would probably be about an hour, but it’s an easy 10 minute drive. Arena District (east-west purple highlight) – The Arena District runs east from High Street along Nationwide Boulevard, past Nationwide Arena (home of Columbus Blue Jackets hockey and monster trucks) to Huntington Park (home of Columbus Clippers baseball). Most of the restaurants are chain restaurants and sports bar type things, but they’ll be good and are all nearby. Since the Clippers are home throughout GP Columbus, that area might be busy. Short North (north-south blue highlight along High Street) – The Short North is a dining, shopping, and entertainment mecca that runs along High Street. It starts immediately across Goodale Avenue north of the Convention Center and runs up to around 5th Avenue. As mentioned, it’s probably a half-hour walk from Goodale to 5th. Rodizio Grill (#2) – If you like meat-sweats, Rodizio Grill is going to be the go-to Brazilian steakhouse for these events. It’s within walking distance. None of us had been there, but “Brazilian steakhouse” was one of our most requested venues. The other option is going to be Texas de Brazil at Easton, which will be a 20 minute car ride from the Convention Center. Melt Bar & Grilled (#3) – Home of delicious, deluxe grilled cheese, Melt is going to be our consensus recommended dinner experience. It’s a 10 minute walk north of the Convention Center. There you will find cheesey goodness, beer, and a 25% discount if you have a Melt tattoo. Piles of cheese and carbs are hard to miss. There’s a second Melt at Easton too. Brother’s Drake Meadery & Bar (#5) – The Meadery (actually at the corner of 5th and Courtland avenues) is at the farther north end of the Short North, about a half-hour walk from the Convention Center. Mead is an interesting experience if you’ve never had it, and walking up there will take you by much of what the Short North has to offer. Turn right at Condado’s Tacos, or stop in for some Condado’s Tacos. Everything else we’re just going to sort of list because you can use Google. Definitely check your favorite restaurant review site in advance and pick some places out. If you want to escape the Convention Center and downtown areas. We also mentioned Cameron Mitchell as Columbus’s big-name restaurateur. Many of his restaurants will be elsewhere by car in one of these areas. Grandview – 15 minutes by car, lots of restaurants and bars.